The Truth About Travelling With A Child.. 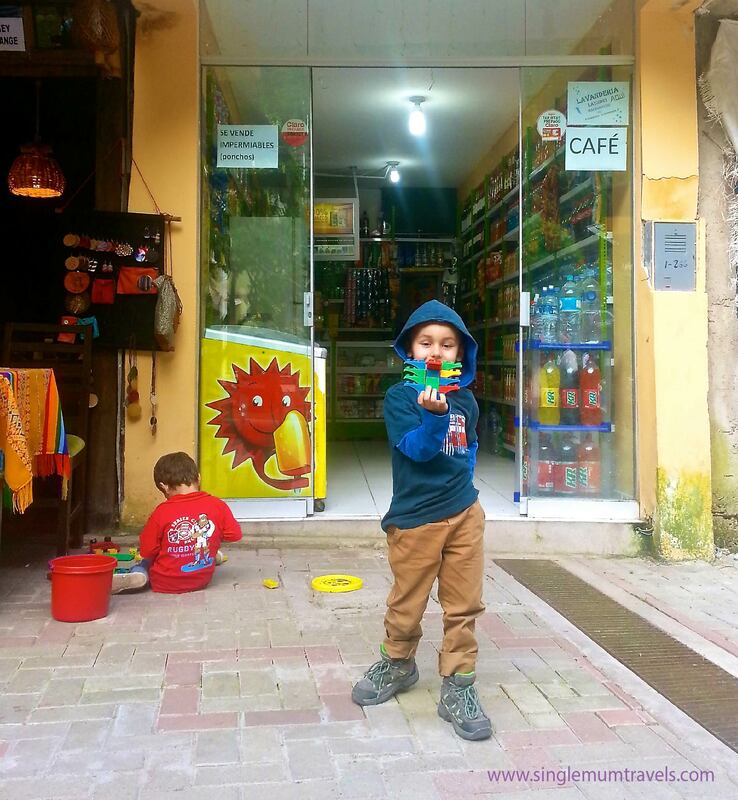 So many people ask “what is it like travelling with a child to a far, unknown, foreign country… And alone”. Some people comment on how brave it is, how educational and stimulating it is for both parent and child. Then there are some who hold some negative thoughts about the whole concept; “It’s dangerous, how can you go all that way alone?” or “He will never remember it so what’s the point in spending all that money” and even “What if something happens to you, you don’t know anyone”. Ok. It’s great to have concerns and worries, this is natural, but anything can happen anywhere in the world, yes it’s true you are far from home but you are not alone, there are people, other humans around and most are warm, welcoming and friendlier than we could have ever imagined. When we were traveling alone through Peru we came across the most kind and gentle people we had ever met. I want my son to see this, most of all I want him to meet these kind people from a far, unknown, foreign country. It is a Lifestyle choice of bonding, spiritual enlightenment, adventure, nature, culture, religion, trust, hope…. There is nothing wrong with escaping the grind of work and school, broadening your horizons and your child’s for that matter, living and growing spiritually. 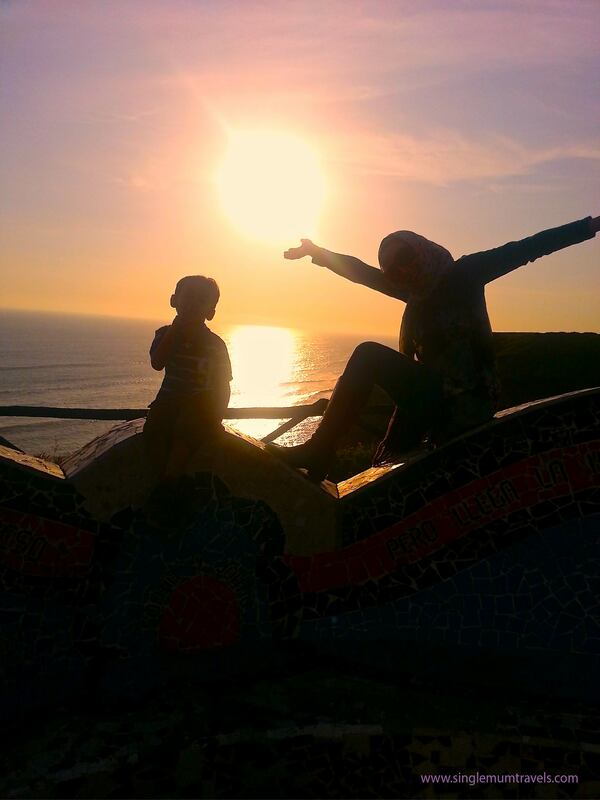 So what can a child really learn from travelling to some far-flung foreign destination? Below is a small collection of pictures and experiences that have helped shape Joshua into a well-rounded young boy full of spirit. Children all over the world no matter what nationality, colour, status or cast, wealth or religion can understand one mutual thing and that’s “TOYS” kids love to play together so why not get them to play with some of the local children?, so what if they don’t know the language, playing is more than just words, it’s about sharing and appreciating love in the world that we live. 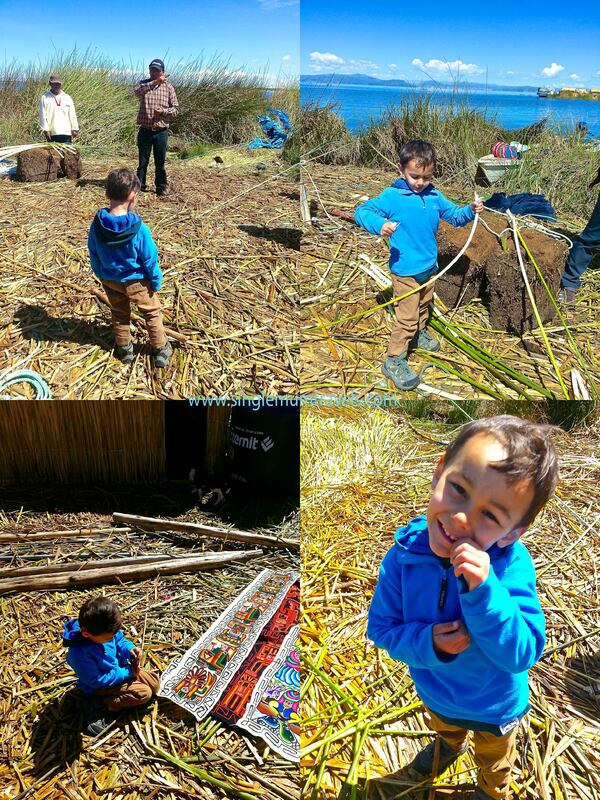 Here is Joshua watching a demonstration and learning how to strip reeds on Uros Island in Lake Titicaca to enable it to be edible, he learnt how they use the totora plant reeds to build their islands, houses, buildings, furniture and boats, and even eat the raw reeds as part of a healthy diet. Most learning experiences that stay with children for life are those conducted outside the classroom, and country for that matter. Your Child Can Learn How A Motorised Canoe Works! 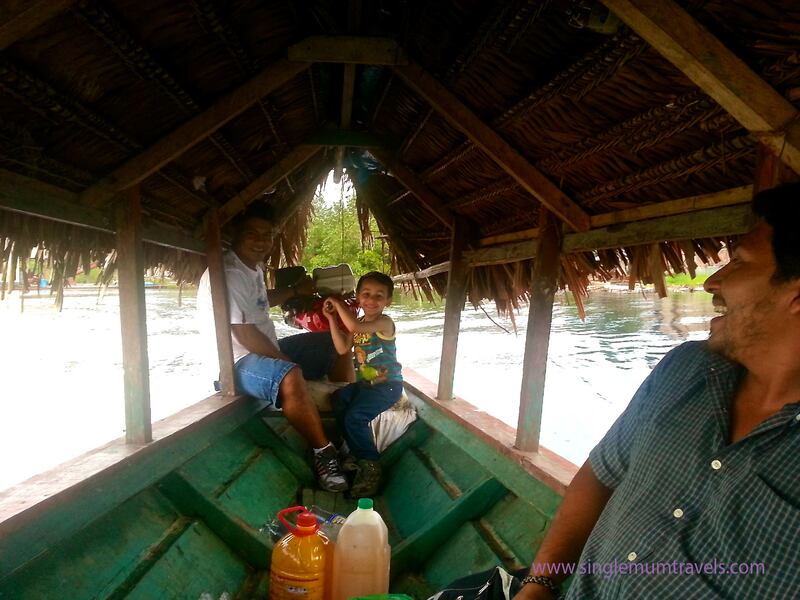 At our first jungle lodge in Iquitos; San Lodge, Joshie got a chance to steer the motorised canoe back home after our excursion to Iquitos Zoo, this is something, which gave him confidence and great joy in doing. He felt needed and esteemed. Your Child Can Experience A Whole New Dish! Wacky and wild! Gator nuggets! Experience new dishes and local delicacies. We questioned this one but decided we had to give it a shot and see for ourselves, we found an American diner just off the main square in Iquitos, I think it was a Texan who owned the joint. So far that’s gator nuggets and red bellied piranha! 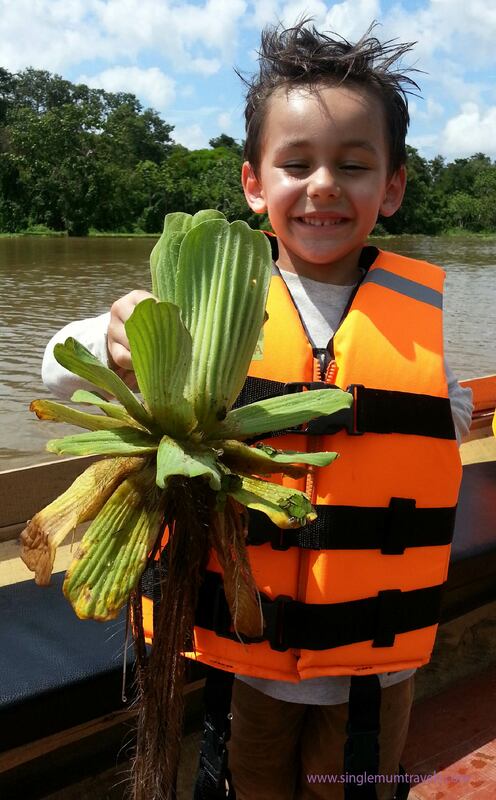 Here Joshua holding an Amazonia lily with its long dangling hairs, they float and drift along the Amazon River, they were great fun to hold and study the long hairs used as roots to collect nutrients flowing down the Amazon River, the most fun part was trying to pull them out the river while the boat was moving! We all had life jackets! Your Child Will Have The Best Opportunity To Bond With You. When travelling far away from home alone with a child, you learn just how much you need each other; company, safety and comfort are just a few, being alone makes you appreciate your child more and vice versa, it’s the perfect situation for bonding. You can take photos of each other, watch amazing sunsets and goof around – just like the picture above, this was taken in Lima’s famous ‘Love Park’ in Miraflores. We had just taken a break from our second tour bus ride around Lima and it was about 6pm when the sun was setting, we took many pictures and got others to take for them for us also. In the Sacred Valley of Urubamba we would lay out on the grass and watch the billions of stars in the sky float past. We would mess around with Google sky identifying the stars and possible planets. We enjoyed our time and never wanted it to end. Yep! 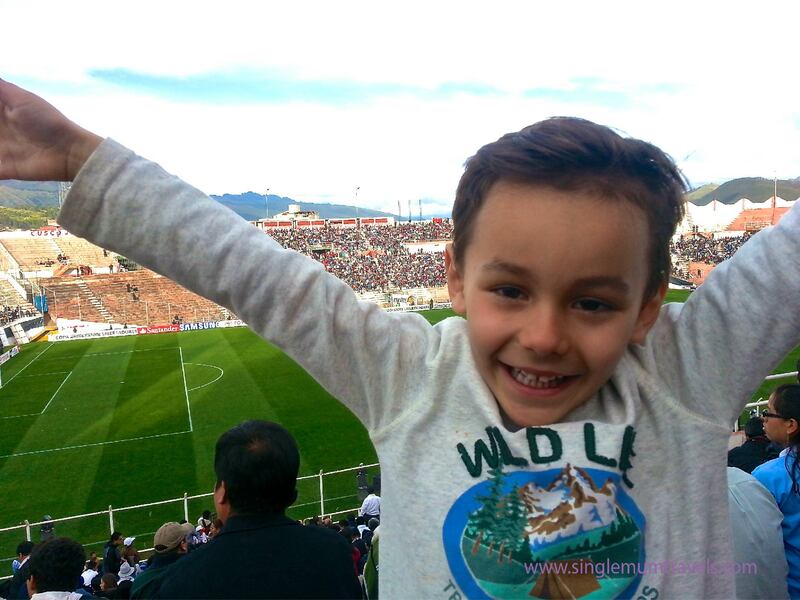 we went to a local football match in Cuzco. The atmosphere was amazing; lively, cheery, full of men, women and children enjoying their time together. The weather was mild; people were selling hats, scarves, flags, sweets, fruit juice and beef on sticks with big fat round grilled tomatoes. The stadium was open air, we got to watch the sun fade away into the blanket of night, the bright lights of the stadium shone and illuminated every player on the field into what seemed glowing men running at top speed. The view from our seats looking over to the Andes Mountains was stunning it was hard for me to keep track of who was winning! We took the motor powered canoe upstream to a village near the Pacaya Samiria. 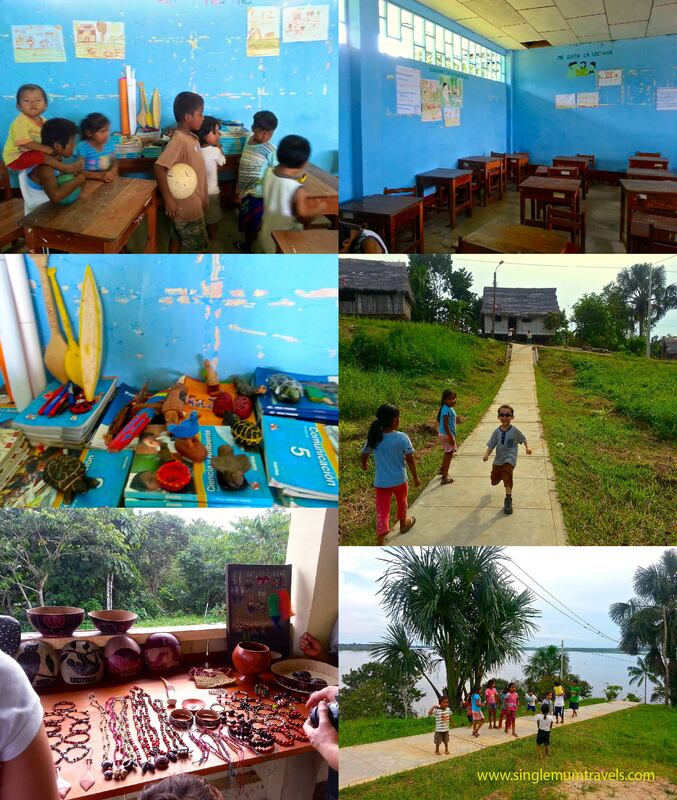 It was approaching late afternoon when we arrived, we got onto shore and were guided around parts of the small community, we went into a large school classroom for Primary aged children, classes contained a range of ages, we saw exercise books, desks and chairs arranged neatly, the nicest of all was the children’s work; their small models or replicas of their environment, canoes, paddles, birds and turtles, brightly painted with great detail. Joshua learnt to appreciate the fact that the children didn’t have the same level of comfort and resources as he has back home in England. The local women were selling their handicrafts; bows and arrows, key rings, wall hangings, wooden turtle rattles, bracelets, games among many other beautifully crafted gifts to help support themselves and their young children. This is one of my most favoured images from our adventures in Peru. 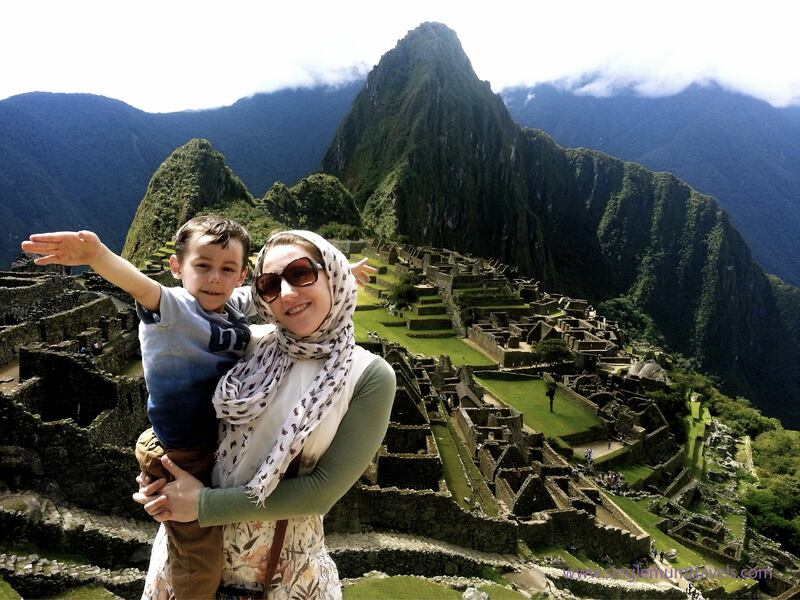 Travelling with a child is amazing but the next step up is travelling to one of the wonders of the world together, and here we are standing over the famous Machu Picchu the home of the Inca Empire, high in the mountains around the Urubamba River. We climbed to the top and looked out upon the view, my breath was taken in an instant, Joshua was amazing at this ‘playground’ of stones and huge rocks with its hundreds of hiding places, he was fascinated by the Urubamba River winding around the mountain, we could almost get a panoramic view of it twisting around. After all of these experiences travelling with Joshua I felt he had gained so much self confidence and independence, all at a level I had never seen him posses prior to undertaking this adventure, it brought him out into the real world, made him feel part of a wider community, part of a global community. Now his mind sees what his eyes could not have contemplated before. Now he has more understanding of what the world is and our role to preserve, protect and create happiness in it. Go travel and see the world with your children. 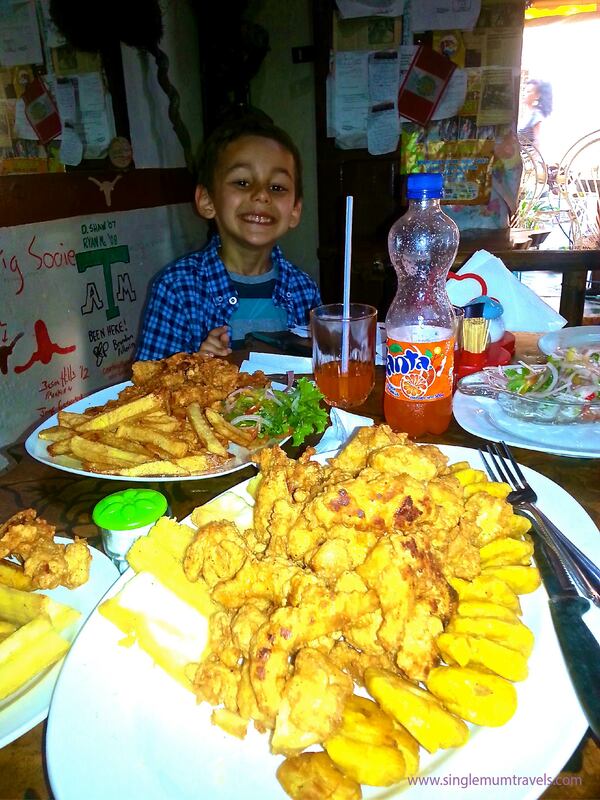 what amazing experiences for you and your son! Totally agree with you! I appreciate not many people can go off travelling for a long time, but even a week here and there is so good for kids! Really winds me up that parents are getting fined for taking holidays during term time. We are currently living in Dubai, having left England two years ago and it has been a fantastic experience so far! My son starts school there in September and will meet such a range of people! Will follow your blog with interest! And wish you luck with your travel plans!